Welcome to this week's edition of Frugal Friday! I must admit, today was a rough day. I had a migraine ALL day. But I did manage to get my Frugal Round-up together. And you'll be glad I did. I hope so anyway. Because did I mention I had a migraine ALL day? Oh, I did? Okay. 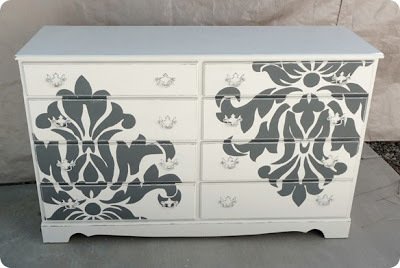 Then...I guess I better just share those links with you... First up, Twice Lovely shared this darling damask dresser. (Lovin' the alliteration there, huh?) This dresser would look perfect in my gray and white master bedroom...I'm just sayin'. Next, Counting Our Blessings shared her $40 mudroom makeover. Love. it. Seriously...$40 never looked so good. Stillwater Story shared her Williams Sonoma shell art knock-off. So pretty. 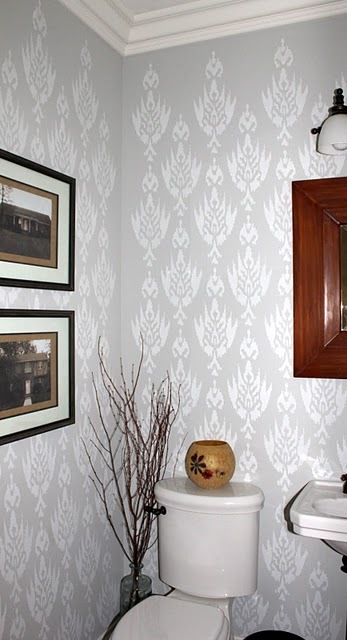 Oakridge Revival shared her ikat stencilled bath. This is fabulous! Finally, Hill Country Homebody shared her master bath redo. Simply stunning! Okay, y'all. It's your turn. Once again... thank you for hosting! I absolutely love discovering all these beautiful ideas! This is my first time linking up with you. Thank you! Linking up my dresser redo! Thanks for hosting! I'm sorry you had a migraine! Ouch. OW! Hope you feel better. Hi Wendy, I have The Shabby Nest on my bloglist, but realized I was not a follower, forgive me! I corrected that tonight! :) Thank you for hosting! I agree with you. That damask dresser would look wonderful in your bedroom! Thanks so much for hosting. (I'm so glad you liked my $40 mudroom makeover!) I really hope your headache goes away . . . Thank you for hosting a linky party! (Even though you weren't feeling well) What a trooper you are! I think I finally have figured all this linky stuff out! What lovely ideas! Thank you so much for hosting Wendy. It's good to be back...it's been a while since I've participated. I hope your head is feeling better! Thanks for hosting and for spotlighting my Williams Sonoma shell art! Happy TGIF! Thanks for featuring my bathroom stencil. Hope your headache is gone by now. Great party! Wow! Tons of ideas. Thanks for hostessing. Looks like another great party! I will be going to check some stuff out even though I have nothing this week. :) Sorry about the migraine, those are so horrible. I hope you are feeling great today! Wow - LOVE that damask dresser! I hope you are feeling better!